QV Plus is a must-have set of tools for QlikView developers. Tutorials are available here and you can download it from here. 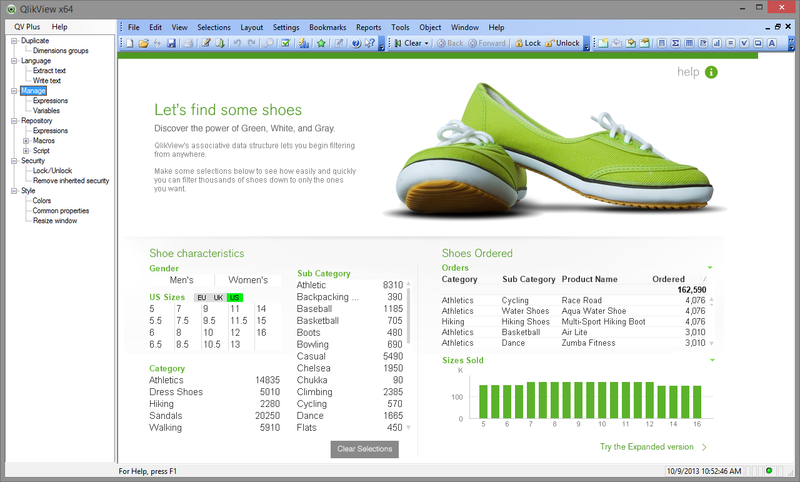 QV Plus is a collection of tools used in QlikView development. QV Plus is developed by TLGsoft (belongs to Softconsult SRL) and is not an official QlikView product. This looks like a great tool! What are the “advanced” features that come with buying a license? And does that license entitle me to future upgrades? Also, as we all know QV really needs a good tool for creating, applying and managing themes. Do you have any plans to add this to QVPlus beyond the properties & colors options you currently have? You will receive all the updates up to version 2.0 which will have new features. Yes, there will be theme import/export capabilities in “Styling” section. Maybe even a visual theme editor. Also, there will be available an extended “common properties” tool (other pages, not just “Font”, “Layout” and “Caption”). Actions section (automated actions triggered by shortcuts, like “Zoom to Fit” action) will be improved. Advanced charts expressions / subexpressions / attributes editor is also on the roadmap. It Seems like a great product and i’m trying to implement it in our company. I’v been trying to test the language translator and it doesn’t seem to work for me. in your movie, while it proccesses the strings, it makes all the captions disappear, and in my computer it doesn’t do so. i am using qlikview 11.2 SR5. let me know if there’s a way to solve it, it’ll be of a great use for us. That would be the “Text extractor”. Well, you need to check the “Replace text with…” to do that. But that option is not available on the free version. Been using the tool for a bit today. Some really great features. I have one question though. When I go to manage the variables, the variables are all listed, but the “Find references” button is greyed out. Is this only available when purchasing the tool, or is there something else I need to do? Some advanced features like “Find variables references” or “Evaluate all expressions” are not available in the free version. Lucian, I can’t seem to get to your server through our company firewall. Is there a download for the 1.0 to 1.1 update? There is no update, it’s a new version. Try using a temporary connection, like your smartphone data connection. Hi, I would like to evaluate the product (translation process) . How can I get a trial version? There’s no trial version. You can use the FREE version to extract all the texts. The PRO version, in addition to extraction, replaces the extracted text with an expression. If it doesn’t behave as advertised, I will fix it or send a full refund. We purchased the product. can you send the full installation? You should automatically get a serial number that needs to be entered in Help -> Activate. I will check the licensing service ASAP. Hi Lucia, I have just bought the license via PayPal. However I haven’t received any serial number neither any activation key. Thank you, Pontus. Your issue has been logged. Sorry about that. Lucian, whenever I use Colors or Common Properties the progress bar gets to what looks to be about 50% and it just stops there. Any idea what the problem might be? I need you to be more specific. What properties exactly are you trying to change, any application or a specific one…. so I can reproduce the problem. Does QVPlus compatible with OS server ? I have installed it on Windows Server 2008 R2 and its does not work. Please define “does not work”. Do you have QlikView 11 Desktop installed? Yes, I have QlikView 11 x64 Desktop installed. Try to first start QlikView, then QV Plus. Through process of elimination, it was two container objects that it was having trouble with. I’m not sure why. I eliminated both and QV+ ran fine. Yes, containers are behaving odd, especially when you delete the master of the objects they contain. It looks like I got the containers fixed. When I opened the container properties the objects within were actually doubled – the first set referring to “document/objectname – not avaialble”. I removed all of those showing as not available and QV+ was able to evaluate the container. Looks like a great tool. To use the advance features we need to buy the product. However, I can’t see any link from where I can buy this. Could you please help me with this? Selling is suspended until… further notice. any idea when selling is restarted? hello, is it possible to buy full version?